Alexander Schlemminger will present a lecture: "From laboratory to robust industrial process analytics – A new level of process insight, process stability and process control with element sensors based on LIBS technology." Visit us at our booth and experience the tremendous advantages LIBS technology brings to you and to your processes! We are looking forward to see you at our booth! We will present you the tremendous advantages of LIBS technology at the exhibition. The SECOPTA team is looking forward to meet you at our booth! Dr. Christian Bohling will present a lecture: "LIBS - Using Laser for inline analysis of aluminium recycling products." At our booth we will show you the tremendous advantages which LIBS technology brings to you and your processes! SECOPTA has exhibited at the Aluminium show 2018 with an own booth. It was shown our innovative LIBS application and be proofed that contiunous, fast and precise element analysis even under extreme conditions has become reality. With the new concreteLIBS, SECOPTA has presented a solution for many questions in building material analysis. In particular, the determination of the chloride penetration depth and the 2D element mapping of drill cores can be performed with the system in high speed and precision. A Presentation was held by Alexander Schlemminger "How laser based element analysis reduces costs, supports stable processes and increases flexibility in modern iron production". 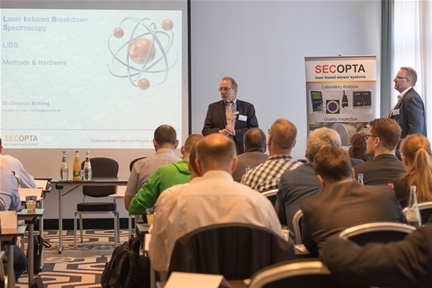 The SECOPTA organized on 28.06.2018 in Teltow her well-attended LIBS seminar entitled "Always know what's inside", which was the first seminar ever in Germany. Against the background of the current "Industry 4.0" discussion, we presented the special features of the LIBS method in more detail, in particular the advantages such as continuous, fast and non-contact measurement directly in the production flow and without sampling and sample preparation. After the very good extensive lectures, the practical part was transferred to the SECOPTA laboratory. The participants were shown the using of our LIBS systems based on DEMO units, which met with great interest. In the evening we celebrated our 20th anniversary with our guests. A big thank you to all our guests, who made the seminar so successful and unforgettable. The presentation "Tackling the challenge of inconsistent raw materials in steel making" was held by Alexander Schlemminger. Dr. Tobias Jochum gives an insight look into the LIBS technology within the scope of the Conference Optical Analytics in the Cluster Optics and Photonics. The implementation of multimodal sorting techniques represents a promising approach by achieving a pre-concentration of valuable minerals already at an early stage in the metallurgical process. In this project we propose to develop a fusion technology including laser-induced breakdown spectroscopy (LIBS) and multi energy X-ray transmission (ME-XRT), which will be able to classify crushed mineral particles on a conveyor belt with the aid of deep learning technology. It's a cooperation with Frauenhofer EZRT, Luleå University of Technology (LTU) and fcfm University of Chile. "Hard- and software for investigating the chemical composition of mineral building materials". "Cost reduction, yield increase and quality assurance through LIBS material analysis from furnace charging to finished product". "LIBS on Segregation Analysis in Metal Fabrication". "Operation of LIBS Elemental Analyzers for Inline Analysis of Aluminum Scrap and Industrial Products". 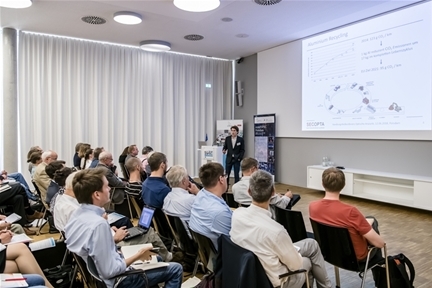 Lecture by Dr. Christian Bohling: "From the laboratory to practice - how to optimize industrial processes and close raw material cycles with fast laser analysis". In collaboration with researchers and users the SECOPTA analytics has developed a "Mobile LIBS device for the analysis of concrete directly on the building - BauLIBS". 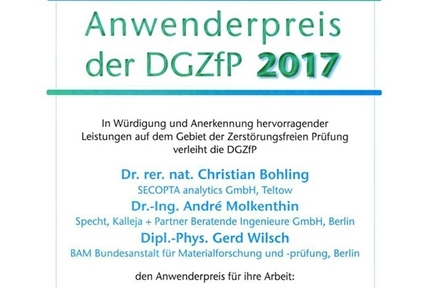 For this work the project team received the User Award of the DGZfP 2017 in the Annual Meeting of the German Society for Non-Destructive Testing e.V. in Koblenz on May 22, 2017. The results were achieved in the subcommittee LIBS in the Technical Committee for Construction of the DGZfP. The SECOPTA team showed their analysis products and discussed suitable applications on an own booth. With the support of the European Fund for Regional Development, SECOPTA analytics has presented its LIBS analysis systems at the joint stand of the Berlin-Brandenburg region "Industrial Automation". 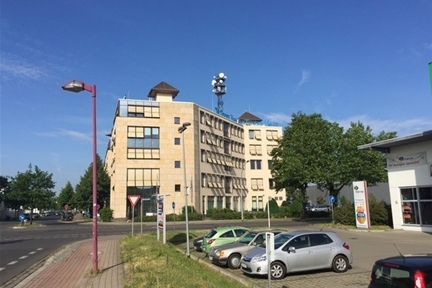 SECOPTA analytics GmbH moved into new business premises in Teltow in the south of Berlin. The business operations will continue unchanged at the new location, your contacts and our Internet addresses will remain unchanged. All offices are located on the 4th floor. Presentation of LIBS analysis systems for inline process control in the accompanying exhibition. Lecture Angelika Feierabend: "Operation of LIBS elemental analyzers for inline analysis of aluminum recycling products"
SECOPTA was selected to present its innovative FiberLIBS inline sensor at the Automotive Innovation Area as part of Aluminum 2016. Convince yourself of the advantages of a 100% traceable inline confusion check (PMI) in Hall 10 Booth I28 . Experience the newest SECOPTA LIBS systems up close! Participation in the exhibition and lecture by Andreas John: "LIBS-Systeme für industrielle Anwendungen; Automatisierte Qualitätskontrolle"
Effective March 16, 2016, the SECOPTA GmbH was merged with the SECOPTA analytics GmbH. As part of the merger, all assets and liabilities as well as all contractual relationships of the SECOPTA GmbH were transferred to the SECOPTA analytics GmbH by way of universal legal succession. The SECOPTA analytics GmbH continues all business operations of the dissolved SECOPTA GmbH. Lecture by Dr. Christian Bohling: "Laser-induced breakdown spectroscopy (LIBS) in recycling of refractory material outbreak"
Lecture: "LIBS element analyzers used for inline analysis of mineral resources and industrial products"
Lecture at the Recycling Innovation Center: "Inline multi-element analysis for mineral based material flows"
We present our analysis systems in Hall A2 at Booth 203/304. Lecture on the current development of the use of LIBS element analyzers in recycling plants. Lecture on operational experience with the MopaLIBS in recycling. Lecture on current progress in the introduction of LIBS-based online analysis systems into industrial production. Poster presentation and presentation of the FiberLIBS lab and other SECOPTA products for the LIBS analysis in the accompanying exhibition. SECOPTA, together with its partners PROASSORT and Eilhauer Maschinenbau, presents LIBS technology for quality control at the ContiTech Booth. SECOPTA presents its LIBS analysis systems on its own booth. With the move within the TGS facilities SECOPTA now has much larger production and laboratory space available. In the extended technical center, customer applications can be developed now in realistic measurement environments, e.g. over conveyor belts. SECOPTA and Minesense (Vancouver, Canada) are establishing a long-term collaboration in mining applications with the delivery and installation of a FiberLIBS multi-element analysis system for different ores. The primary goal is to increase the efficiency of treatment processes by using spectroscopic analysis technology. In the lecture "Laser induced plasma spectroscopy - a "Cutting edge"-technology of the circular economy" Dr. Christian Bohling will present technological fundamentals and current applications in the field of laser-induced breakdown spectroscopy. Multi-element analyser for laboratory applications. In addition to the tried-and-tested industrial inline measurement systems, SECOPTA now also offers a solution for material science issues in the application-oriented laboratory. In a measuring chamber with a laser-protective window the measuring head will be moved on an defined XYZ trajectory. Complemented with a target laser and a high-resolution camera system this enables precise measuring point control and 2D scans on even surfaces. SECOPTA will be showing a demonstration system for compact LIBS sensors in the accompanying exhibition. Lecture: "Use of optical measuring systems based on LIBS spectroscopy for the analysis and classification of mineral materials"
Lecture focusing on quality control of non-ferrous metals and presentation of compact LIBS sensors for inline and offline material analysis at a booth in the accompanying exhibition. Lecture at the 5th International Conference "MBA, Sorting and Recycling" on LIBS process measuring technology for the classification of non-ferrous scrap from waste treatment plants for subsequent sorting. A new multi-element analysis system for recycling applications is now available. The new MopaLIBS system enables an up to 10 times higher measurement rate than the previous FiberLIBS. With a repetition rate of up to 1kHz, it is ideally suited for fast sorting tasks, such as recycling. At the 13th International Symposium on Soil and Plant Analysis, analysis results obtained using the FiberLIBS system of SECOPTA were presented. Lecture by Robert Miller, ALP Technical Director: "Soil characterization using compact commercially available LIBS system"; Section 6 "Emerging Technologies (1)"
Lecture about LIBS applications in the inline material analysis and demonstration of a demo system in the accompanying exhibition. Presentation of the prototype of SECOPTA´s trace detector TDetect in the accompanying exhibition of the 2nd International CBRN Symposium. Lecture on LIBS applications in recycling of refractory material and participation in the poster exhibition. Together with Horn & Co. KG SECOPTA presented an industry reference for the FiberLIBS analysis system using the application of sorting wasted refractory material. Lecture on LIBS sensor technology in sorting applications and presentation of SECOPTA´s available products and sorting concepts for recycling applications in the accompanying exhibition. Lecture on the potential of LIBS analysis in the extraction of raw materials and presentation of the FiberLIBS analysis system in the accompanying exhibition. Presentation of the prototype of the portable explosive sensor XDetect in the context of the topic of sensor technology for security applications in the field of security research. The Molecular Biology Cluster network Potsdam MoBiCluP supports the member and partner companies in the development of competencies in molecular biology and biotechnology and in the realization of joint research projects. SECOPTA will contribute its own experience in the detection of biological materials and further explore the possibilities of using LIBS analysis systems in this field. Presentation of SECOPTA's new FiberLIBS analysis system in the accompanying exhibition. The new features and extended user benefits of the FiberLIBS system are presented in a short article in the Physik Journal ("Best of"), October 2010 issue, and INNOTECH Magazine, Issue 4/2011. Lecture "Trace detection of nitrogen-based explosives with UV-PLF" (7838A-9) on the results of SECOPTA in the development of a portable explosives detection system. Session "Local Sensing: Nuclear, Crime Scenes, Narcotics, Explosives, and Chemical and Biological Agents II". Poster presentation of the new design of an industrial LIBS multi-element analysis system. Poster presentation of the hazardous substance detector XDetect in the exhibition of the workshop: "Innovation potentials for person control - How can air traffic safety be made even more reliable and efficient?" Overview lecture on "LIBS sensors for industrial applications" in the session "Optical Sensors". Together with the Heinrich Hertz Institute SECOPTA introduces an explosives detector. Presentation of the suitable for industrial use LIBS-SORT sensor system in the accompanying exhibition. The current article "Microchip laser revolutionizing LIBS spectroscopy" describes the fundamentals and applications of LIBS systems based on microchip lasers. 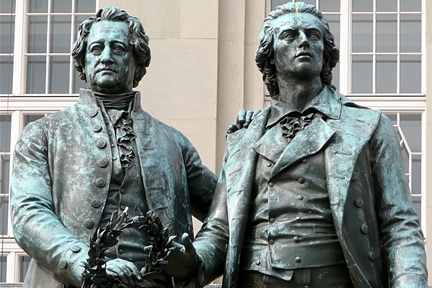 The article was published in the journal "Laser + Photonics" of the Hanser-Verlag. With its project partners from the TU Clausthal and the Defense Research Institute for ABC Protection Technologies (WIS) SECOPTA presents current work in the field of detection of hazardous biological substances. Lecture by Mario Mordmüller / TU Clausthal: "Determination of hazardous microbiological samples" (No. 7484-14) in the session "Optically Based Biological and Chemical Detection for Defense V"
In an article in the Journal WLB - Wasser, Luft und Boden, Zeitschrift für Umwelttechnik (Issue 9/2009), SECOPTA presents current developments in the field of industrial LIBS systems and their use for the recycling of scrap metals.